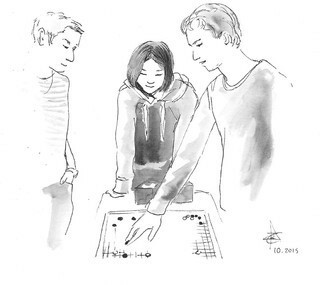 No free massages or tacos (a la the Cotsen Open) but next weekend’s 18th “Go to Innovation” tournament in Berlin does offer free draught beer in the cafeteria starting at noon on Saturday. Ting Li 1P, Pavol Lisy 1P and Ilya Shikshin are among the players slated to compete for over 3,000€ in prizes including a 500€ Omikron Data Quality GmbH-Prize for the best female gamer and a 500€ Jackpot for 8 wins. The French Team Championships took place October 24-25 in Lans-en Vercors, near Grenoble, France. Would the defending champions, Grenoble 1, maintain their title by defeating the 13 challengers? Grenoble 1 had added Motoki Noguchi — who was unavailable last year — to their squad as a replacement for Denis Karadaban, who is studying in Korea. Logically they were in an excellent position to keep their title, their mean rank of 6 dan being three ranks above their nearest rivals. We note however, the increase in the number of teams with a mean rank of 2 to 3 dan, presented serious challengers for the podium places in Rennes, Lyon, Jussieu, Grenoble 2 and 3. The first round passed without surprise for the strongest teams. In the closest matches Lyon bested La Rochelle and Toulouse beat Antony. In the second round, the surprises began. 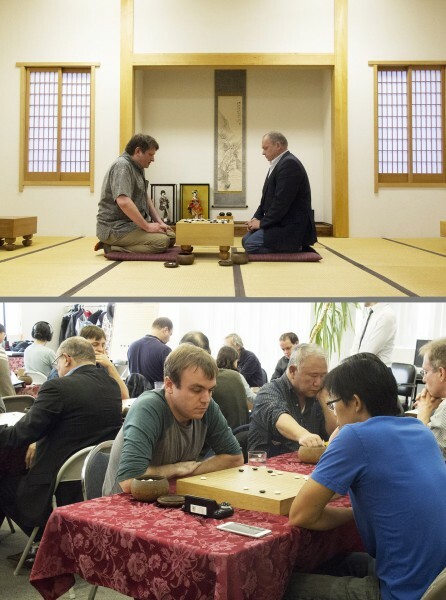 Suddenly, Grenoble 1 lost on boards 3 and 4, Toru Imamura-Cornuejols (4d) and Simon Billouet (4d) lost respectively to Louis Meckes (1d) and Robin Chauvin (1k), so Lyon grabbed a draw. Similarly between Toulouse 1 and Rennes 1, Benjamin Papazoglou (5d) lost to Li Haohan (3d) and Fabien Masson (1d) to Xavier Bonnefond (1k). Thus the top 2 seeds, the reigning champions and vice champions, got off to a rotten start. It was Grenoble 2 who took the lead in as they disposed of Jussieu – would they manage to upstage their club mates Grenoble 1? On Sunday morning, Grenoble 1 regained their form with a 4-0 whitewash Toulouse 1. Rennes 1 overcame the obstacle of Jussieu with a 3-1 victory. Once again Lyon grabbed a draw, but this time with Grenoble 2. Before the last round then, the battle for the title was unclear: three teams had 5 points (Rennes 1, Grenoble 1 and 2), and none had played the other. Would we see a tie? The draw for the final round set Grenoble 1 against Grenoble 2 and Rennes 1 against Grenoble 3. Rennes 1 won 3-1 (Thibaud Naegele dropping a point against Chen Longteng) while Grenoble 1 also won 3-1 (Toru dropping the point to Xiao Chunyang). Grenoble 1 and Rennes 1 were then tied for first place with 7 points; but the title stays with Grenoble 1 though, because they had 1 extra board win (13 to Rennes’s 12). 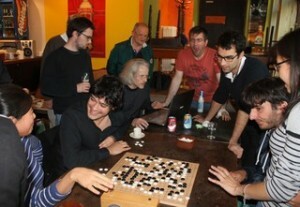 Picking up third spot were the brave team from Lyon. Full results can be seen for team and individual games. 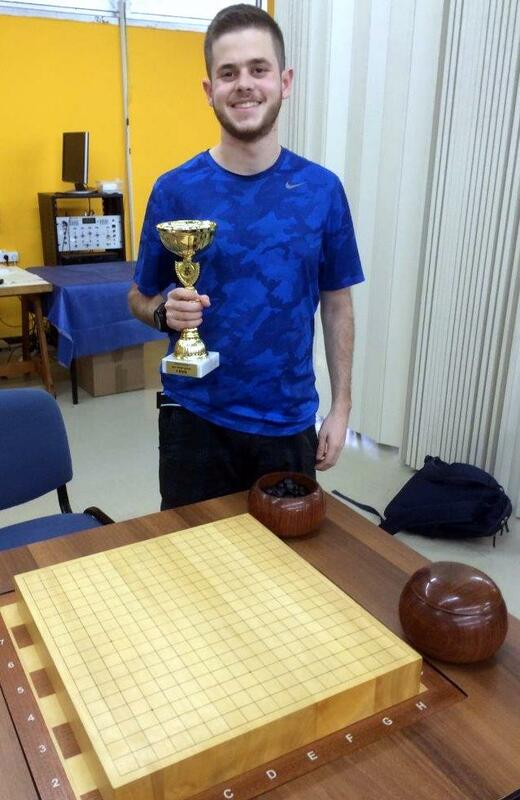 Junfu Dai 8D (Paris) won the French Championship on October 3-4 in Lyon, topping the field of right of the strongest active amateur French players and becoming the French representative to the next World Amateur Go Championship. Thomas DeBarre 6D (Strasbourg) and Alban Granger 4D (Rennes) took second and third places. Click here for complete details. Meanwhile, the tournament of Lyon, with about 80 players, was won by Motoki Noguchi 7D (Grenoble), ahead of Florent Labouret 3D (Lyon) and Florent Rioland 3D (Marseille). 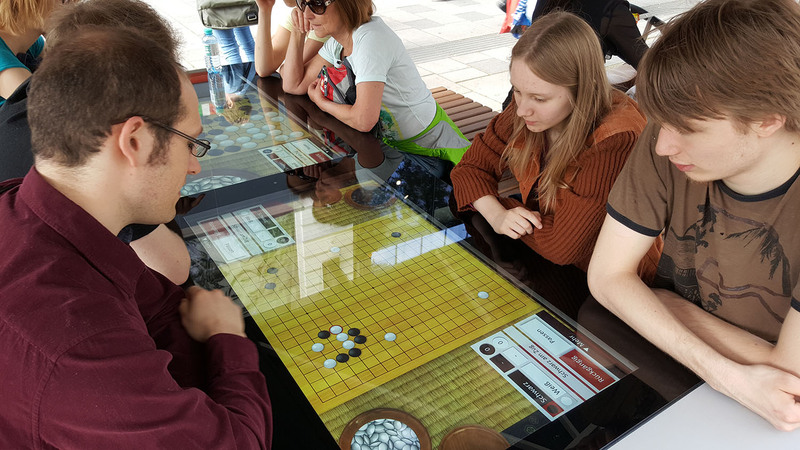 The Public Touchscreen Go Table project was the work of a team led by Daniel Bösze, board member of the Austrian Go Federation, who wrote the software and negotiated with the city of Vienna to install the board. The project about a year and a half from start to opening ceremony and cost about $20,000 out of pocket, not including donated project planning and coding time, including $11,000 for the board itself. 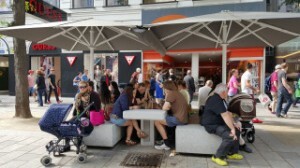 Since it opened in October 2014, the table has been averaging about 100 games a day, benefiting from a location on one of the busiest shopping streets in Mitteleuropa, Mariahilfer Straße. The board has room for two games at a time and is shielded from sun and rain by two large parasols. Bösze was awarded €1,000 for first place. Pruitt and Lockhart meanwhile were awarded second place and a €500 “encouragement award” for their film, with which EJ readers are familiar. It is currently being finished up so it can be submitted to film festivals this fall and winter. It will premiere in Spring 2016. Third place, also €500, went to Proyecto Gakko no Go, which since 2008 has taught go to low-income children at in the Jesús Maestro School in Petare, Caracas, Venezuela, one of the more marginalized and dangerous favelas in the country. The project was organized by Sister Marsela Mujica of the Catholic organization Fe y Alegria, who became enchanted by the Hikaru no Go manga. Starting with essentially nothing, she received support from the Venezuelan Go Association, Fe y Alegria, the Thai Go Association, Sociedad de Intercambio Internacional de Go, the Colegio Japones de Caracas and the International Go Federation, along with teaching visits from Argentinian player and organizer Fernando Aguilar. 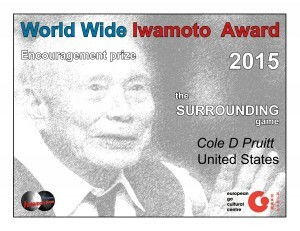 “My congratulations to the three winners and hats off all the people who submitted projects,” said AGA president Andy Okun, who along with Aguilar and a half dozen other go officials and organizers, served on the Iwamoto Award jury. 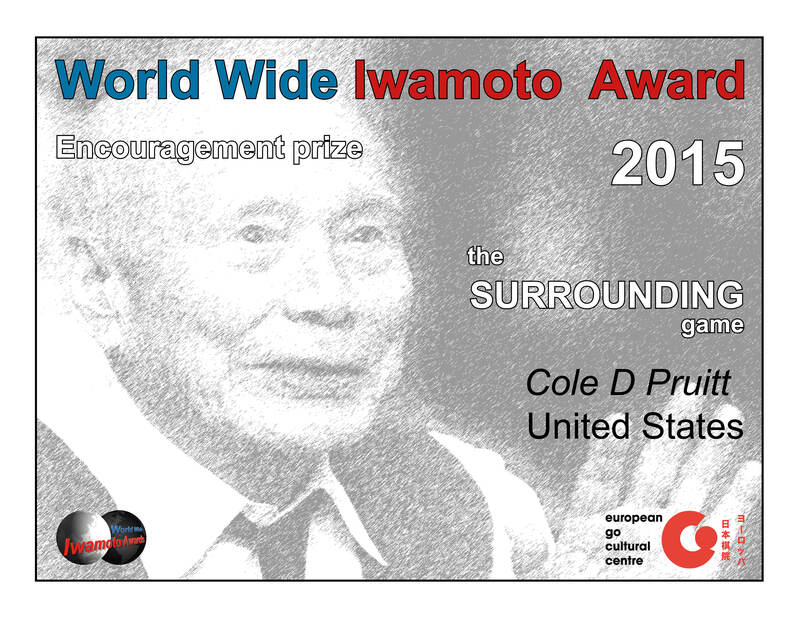 “It is amazing what people can do when they are tireless and dedicated.” The Iwamoto Awards seek to encourage projects that promote the spread of go. 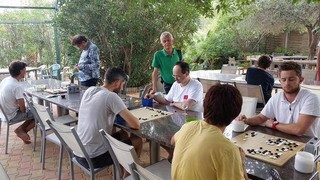 They are named for the late Japanese champion Iwamoto Kaoru, a tireless advocate for go for many decades, and are run by EGC with support from the European Go Federation and Nihon Ki-in. Details of all the submitted projects can be found on the EGC website.